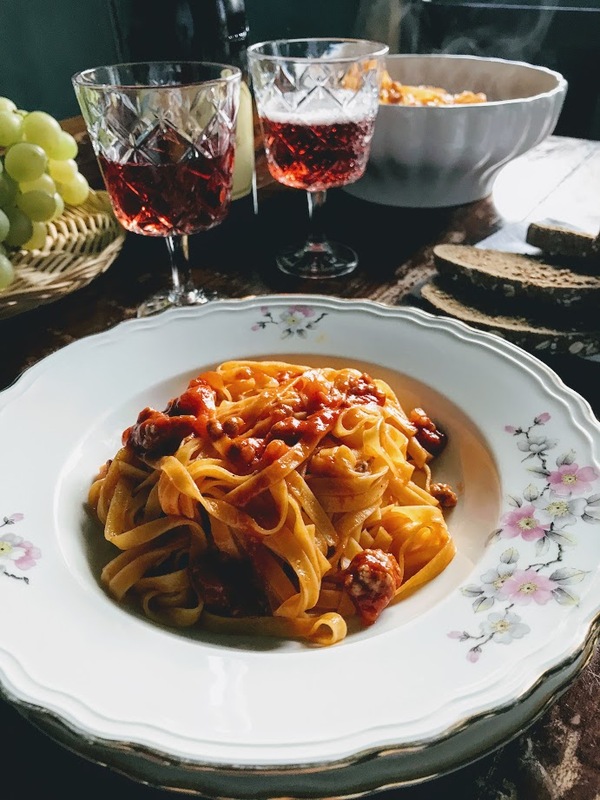 dà libero sfogo al suo amore per i mobili asiatici, senza tradire per un attimo lo stile classico francese. 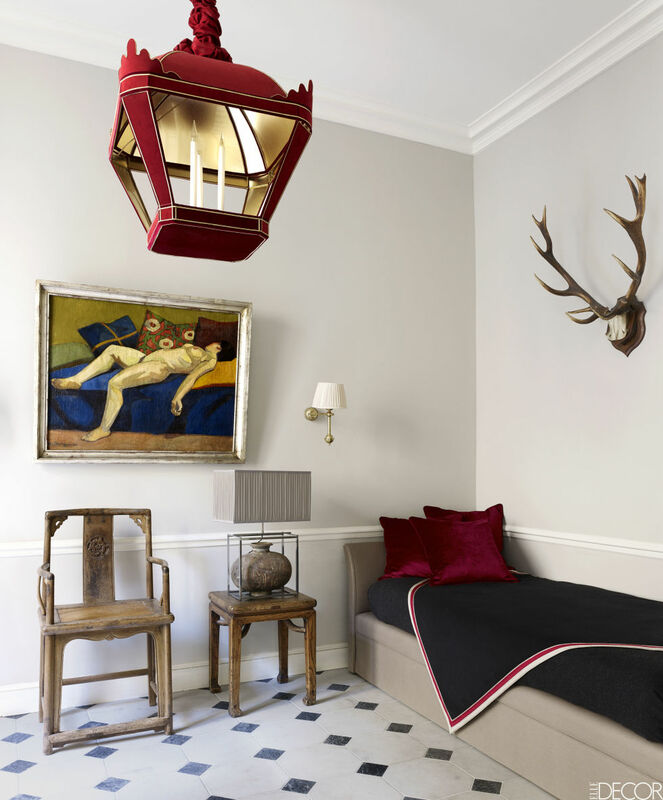 The bedroom's animal drawings include works by Paul Jouve, Georges Lucien Guyot, and André Margat, the bed is a custom design, the rug is an antique Persian, the 19th-century chandelier is by Baguès, the curtains are of a Holland and Sherry tweed, and the walls are painted in Farrow and Ball's Wevet. 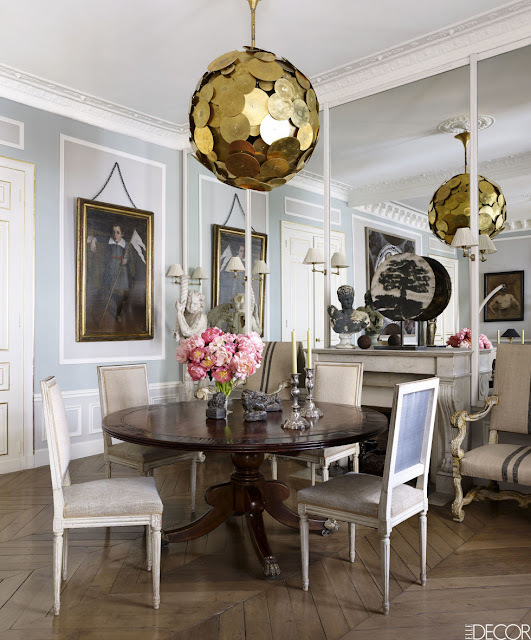 The circa-1910 dining table is English, the Louis XV–style linen-covered chairs are trimmed with ribbon by Houlès with a Jim Thompson silk on the backs, the marble fireplace is original to the apartment, and the painting dates from the late 17th or early 18th century. 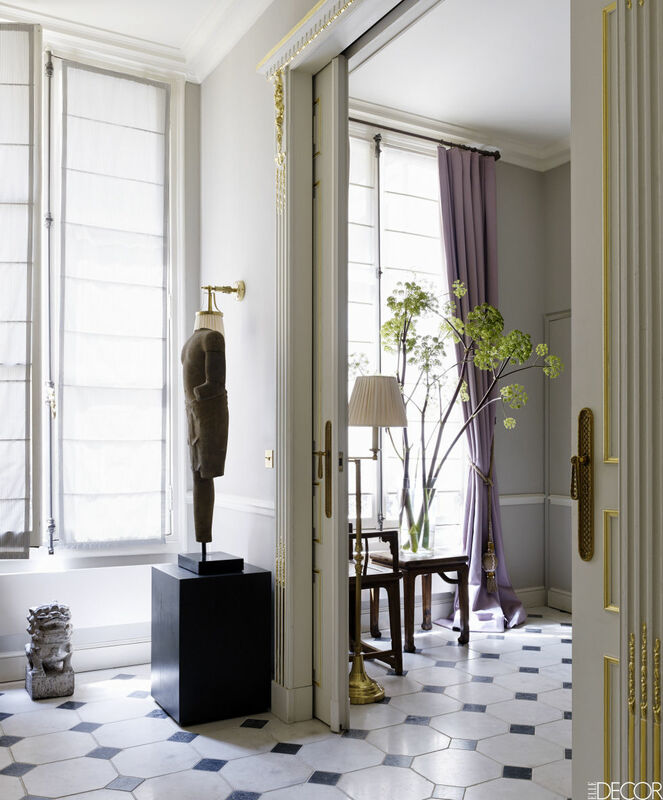 The daybed and light fixture in the entryway are custom designs, the Chinese chair and side table are from the Qing Dynasty, the 1939 painting was found at a Paris flea market, the walls are painted in Farrow and Ball's Cornforth White, and the 19th-century marble tiles came from a farmhouse. A Khmer sandstone statue and a Ming Dynasty garden ornament in the entryway. 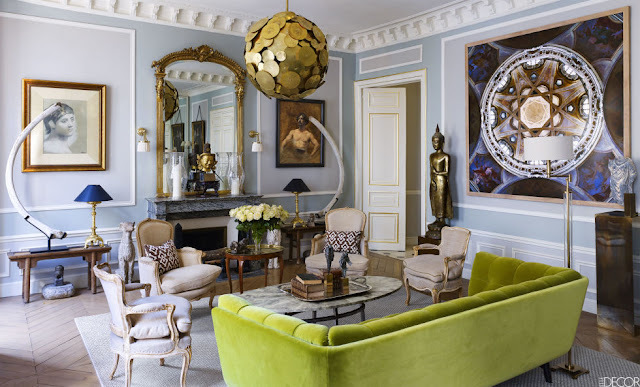 In the living room of the Paris apartment of designer Christopher Noto, the sofa, which is upholstered in a Rubelli velvet, and the cocktail table are custom designs, the Louis XV chairs are covered in antique linens, the floor lamp is by Stéphane Olivier, and the 17th-century Buddha by the doorway is from Thailand; the Italian pendant light is from the 1960s, the rug is sisal, the flooring is original to the apartment, and the walls and trim are painted in Farrow and Ball's Cornforth White, Wevet, and a custom blue-green mix. 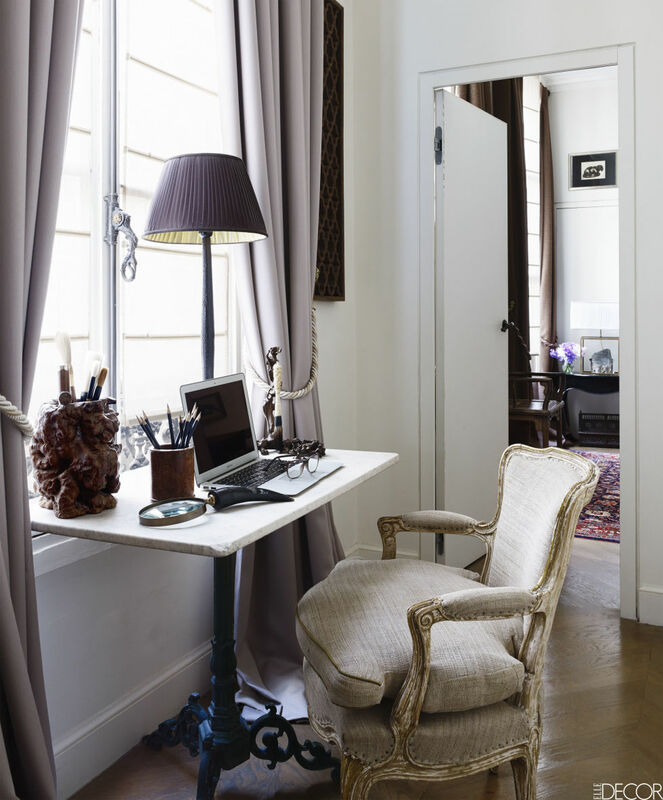 the first image : A 19th-century iron-and-marble garden table serves as a desk outside the bedroom; the chair is in the style of Louis XV, the lamp is a custom design, and the curtains are of a Holland and Sherry cashmere.